Good design is often born from a need to make everyday items more functional and more beautiful. 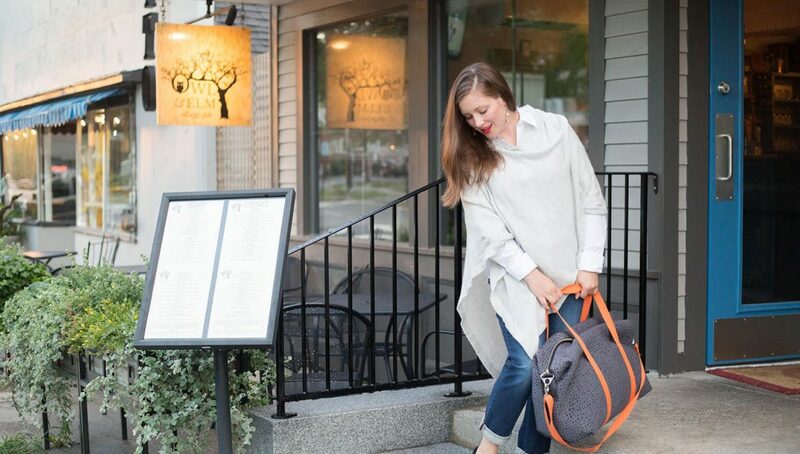 Jess Lynch, owner of Pips and Squeaks, a children’s boutique in Yarmouth, noticed as her kids were getting older and her family started to travel more, that packing efficiently for a family of four was no easy feat. She sacrificed her own colorful accessories to save space overall, which meant her own ensembles while traveling felt…bland. 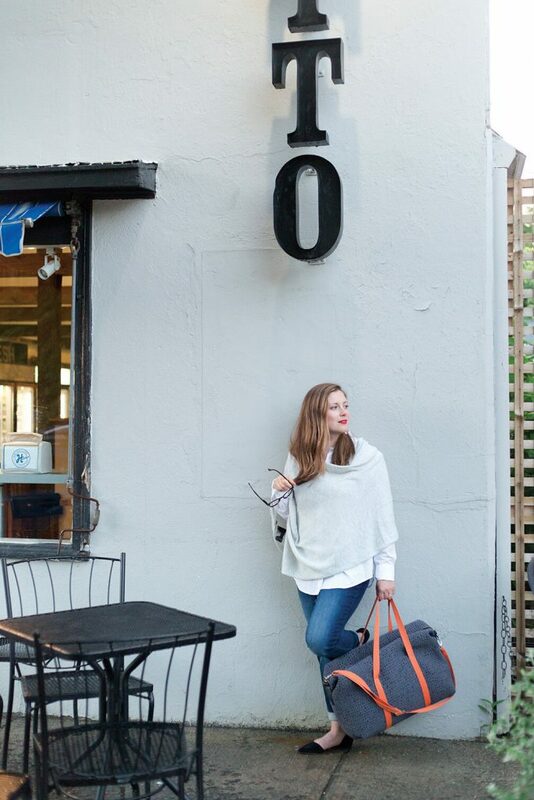 She spent hours searching online for her ideal travel bags (simple design, collapsable, bold pops of color, renewable materials and ethical manufacturing practices), but couldn’t find exactly what she was looking for. 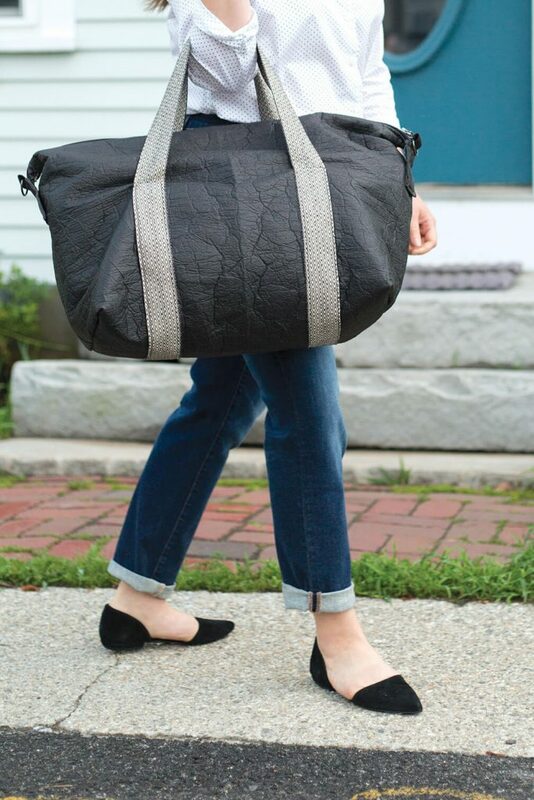 Not one to give up—or to shy away from a project—she started looking for the raw materials to make them instead, and thus the Jess Hart Lynch line of bags was born. Lynch wasn’t looking for just fabrics though. Like with her children’s clothing brand, every step in her creative process keeps labor ethics and environmental impact in mind. Leather is beautiful and durable, but the tanning process can be detrimental to the people who are doing it, and it can be bad for the environment around the facility as well. So Lynch honed in on leather alternatives that were visually interesting and durable. One such product is made from Piñatex by Ananas Anam, a natural material manufactured from the leaves of pineapples. The leaves are a natural agricultural byproduct that farmers would otherwise have to dispose of or burn. Instead, the leaves are processed into Piñatex fabric by the Ananas Anam company, so waste turns into income for farmers, providing them an additional revenue stream and creating another life for what would otherwise be refuse. The look and feel is certainly different from leather, but the durability, visual and physical texture, and ethical roots make it the perfect choice. Lynch buys zippers made in the U.S. and sources fabrics from designer deadstocks, repurposing these gorgeous fabric ends into limited-edition bags. The gray bag with orange handles, pictued on the opposite page, was sourced in this manner. It’s a wool blend, which offers a durable and renewable material, exemplifying the values at the core of Lynch’s design. Lynch likes to dress in simple, comfortable neutrals and switch things up with playful accessories like bags and shoes (hence the fun luggage! ), so we opted to pair her playful creations with a classic closet staple: a white shirt from Maine’s own Jill McGowan. There’s something about a perfectly crafted button up, jeans and flats that makes me feel ready to take on the world. Fashion certainly has its share of innovations, but the empowerment we magically feel from this simply pulled-together combination will always make it a winner. We added the sumptuously soft cashmere poncho, also available at McGowan’s shop (56 Main St., Freeport), for a cozy layering piece perfect for the car, plane or in a chilly office. We also test drove some glasses that protect your eyes from computer blue light (also available at McGowan’s shop) for good measure. They’re certainly the most flattering eye protection we’ve come across to date! The Jess Hart Lynch line isn’t limited to luggage. She also designs and manufactures wristlets, totes, reusable shopping bags, backpacks and more. From its heart, the brand is built upon a desire to provide people an ethical choice for locally made, responsibly sourced items they can be proud to wear and love every day. For now, every item is lovingly crafted by Lynch in her Yarmouth studio. Each material is thoughtfully chosen for the story and meaning attached. Her long-term goal is to have the JHL line carried at department stores, keeping the design and manufacturing here in Maine. 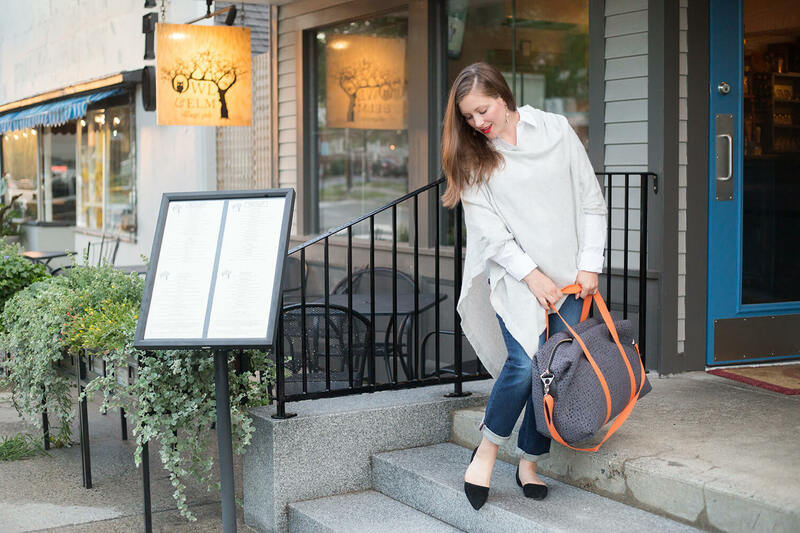 The phrase “Made in Maine” has a proud tradition of quality, and she hopes to continue that tradition while creating ethical fashion we can all enjoy.